Farthest to the east, Sword Beach boasts the original Pegasus Bridge, preserved at the Pegasus Bridge Museum. The museum tells the story of all the British airborne operations in the Battle of Normandy, including the landing of Horsa gliders just yards from the bridge. Visitors can walk the actual bridge behind the museum to see a plaque dedicated to a British solder killed during the assault on Sword Beach, and view WWII-vintage vehicles, a bailey bridge and the remains of a Horsa glider. The Canadian target areas of Juno Beach are a bit more touristy, but still have a few guns preserved along the coast. Be sure to visit the Canadian Museum to understand Canada’s role in the war and in the D-Day invasion. 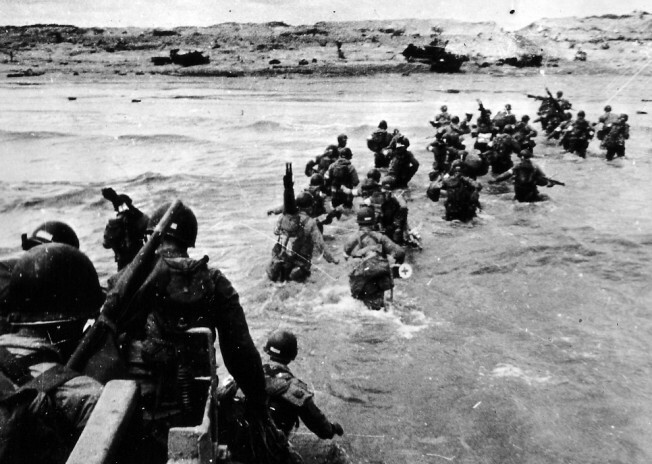 Moving along toward Gold Beach, the visitor will see one of the most impressive sights of all the D-Day beaches. The remnants of the Mulberry harbor, the Phoenix caissons ad the pontoon reinforcements from the roadways still lie off the beaches. Visit the Arromanches Museum to see how the Mulberry harbor worked, and check out the 360-degree theater In town to view images of the Normandy invasion mixed with images of the area today. Visitors to Omaha Beach can see numerous bunkers and structures to get an understanding of the ferocious German defense, and see the same view that those defenders saw on that June morning. Strolling around the hillsides will reveal bunker after bunker, hidden by overgrowth but still sobering to see. Also at Omaha Beach, of course is a huge memorial to the liberators, including a plaque to the men of the 2nd Ranger Battalion who breached the seawall, so graphically depicted in the opening sequence of Saving Private Ryan. And no visit to Omaha Beach is complete without stopping at the American Cemetery at Colleville-sur-Mer, where 9,378 crosses mark graves, and a wall lists the names of 1,557 who were listed as MIA after the epic Battle of Normandy. Along the way to Utah Beach, you’ll see the rocky outcropping Pointe du Hoc, where American Rangers scaled the cliffs to knock out German guns. The cliff is still marked by giant shell craters from numerous bombing missions by the Army Air Corps. At Utah Beach itself, the visitor will find an excellent museum on the site of a German observation post, which is preserved inside. There you’ll reflect on the good fortune that visited the American troops who mistakenly landed where German defenses were weakest, thus making the Normandy invasion far less bloody here at Utah Beach than at the others. Whether your primary interest among the D-Day beaches is the world famous Omaha Beach, lesser known Sword Beach, or Utah, Gold or Juno, plan on spending several days in order to fully appreciate the history of the D-Day invasion. And if you’ve already visited the D-Day beaches, be sure to share your experiences and thoughts in the comments below. At Military Heritage Network, we know that everyone’s experience is a personal one. Tags battle of normandy, d day beaches, D-Day, German, Juno Beach, military, Normandy Invasion, omaha, omaha beach, Roman, Sword Beach, the d-day invasion, Utah Beach, World War I, WWI, WWII.